Little Women has been one of my favorite books for a very long time, and I thought this was a well-done modernization of Louisa May Alcott’s story. If you’re looking for total accuracy to the book, you won’t find it, but considering that they had to both modernize and fit everything into a 2-hour movie, the changes worked okay. The movie starts with Jo as an adult, trying to get her writing published in New York City, and tells the story mostly in flashbacks. I liked the format and thought it was a good way to make such a familiar story more interesting and fresh. In order to fit everything in, they had to make some changes to the timeline, which did mean that certain relationships weren’t explored or explained as much as I would have liked. But I think it’s impossible to fully do justice to everything from the book in one movie, and overall the pacing was really good. Choosing to focus more on Jo’s story, while it meant that other things were glossed over, made the movie more cohesive and focused. For the most part, the actors were well-cast and did a great job. Laurie was perfect; Lucas Grabeel perfectly captured the character that everyone loves, while still giving him a fresh spin. The same with Ian Bohen, who played Professor Bhaer (i.e. Freddy); it was a new take, and not how I would have imagined him, but it really worked and still captured the essence of the character. The sisters were really great, and while it was a little weird that the same actresses played the three older ones for the whole movie as they grew up, it worked out pretty well. And the switch of actresses for Amy was rather disorienting, and I didn’t particularly care for the older one; so I’m actually glad they didn’t do that for all of them. The only actor that I found disappointing was Brooke. He was done as incredibly awkward, and maybe I missed something, but that’s never how I imagined him. Overall, I thought the movie did a great job portraying the essence of the book. There were lots of funny moments with the sisters that, to me, perfectly captured what it’s like to grow up in a big family. It especially meant a lot to me seeing this movie at this stage in my life; I have three younger sisters, and having just moved away to college, I spent about three-fourths of the movie in tears because of how much it made me appreciate my childhood. Watching the March sisters grow up and have to navigate changing relationships and lives hit very close to home for me right now. I would recommend this movie to anyone who wants a sweet movie that will make you laugh and cry. It explores the importance of family and of going after your dreams, and how hard that can sometimes be. While it’s not anything super deep, it’s a feel-good, enjoyable watch for a cozy fall day, especially for anyone who loves Alcott’s story as much as I do. 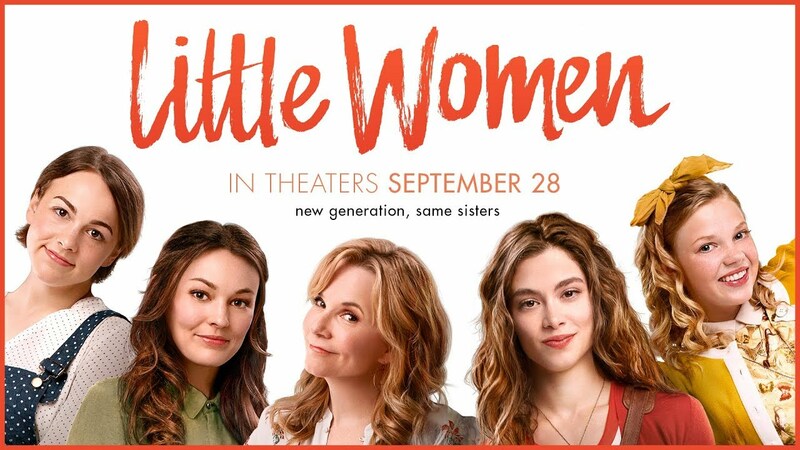 Have you seen Little Women, and if so, what did you think of it? Share in the comments! Have you seen the BBC Little Women? I thought it was fantastic and beautifully done and acted. I haven’t! I really should, it sounds really good. I saw it in the theater! I don’t know if it’s available yet anywhere else. Yeah, I can understand your worry! I definitely don’t think they ruined it. There were some things I wish they had done better, and the modernization takes some getting used to/makes it a little shallower than the book, but overall I think it captured the story pretty well.